The following information was taken from Wikipedia. Mendham is a village and civil parish in the Mid Suffolk district of Suffolk in eastern England. Located on the east bank of the River Waveney around a mile east of Harleston, in 2005 its population was 440. The parish includes the hamlets of Withersdale Street. The Mendham Marshes are also within the parish boundaries. Until the 19th century, around 25% of the parish fell in Norfolk and 75% in Suffolk. Mendham's most famous son, born to a local miller, went on to become Sir Alfred James Munnings KCVO, PRA (8 October 1878 – 17 July 1959), known as one of England's finest painters of horses, and as an outspoken enemy of Modernism. 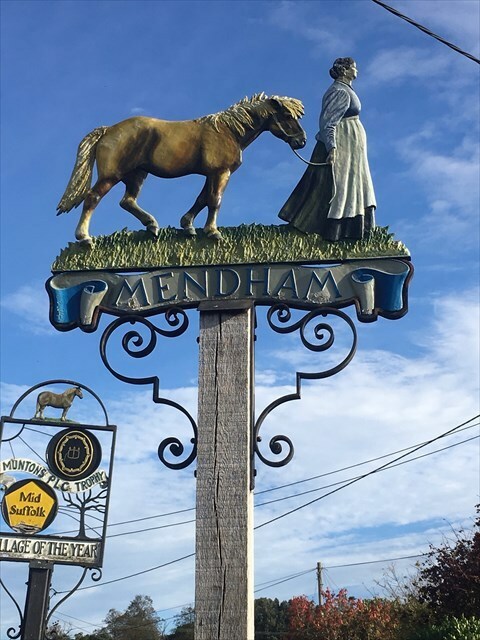 An extract of one of his paintings, featuring gypsy Charlotte Gray leading a pony, has been incorporated into the Mendham village sign. Her husband Frederick or 'Nobby' Gray was one of Alfred's closest friends and a model in some of his paintings. Both Nobby and Charlotte are buried in All Saints churchyard in Mendham. This cache is a simple 2 stage multi as I was unable to place a traditional because of existing caches. Find the information required at stage 1 to obtain the co-ordinates a for the final. At the posted co-ordinates you will see an item with all the information you will require. The cache is located a short walk away. Tweezers will be required and you may encounter livestock on route this however depends which way you decide to go. N52 23. (Halesworth - Homersfield)(Withersdale)(Halesworth - Homersfield - Withersdale - Harleston - St Cross).